Conservative ideas are making an astonishing comeback—thanks in part to the ceaseless efforts of The Heritage Foundation, a public policy think tank that promotes the principles that made America great: free enterprise, limited government, individual freedom, traditional American values, and a strong national defense. 1. Liberals’ grip on power might survive through 2012 and beyond, sending America permanently into European-style socialism, with permanent high unemployment, business-killing regulations and taxes, a shriveling private sector, and a loss of stature in a dangerous world. 2. A failed conservative comeback would squander this once-in-a-generation opportunity to return America to her founding principles in this pivotal year. But in order to continue accelerating conservative ideas and policies in Washington, The Heritage Foundation needs the support of every friend and Member. Please join our fight. Complete and submit the form on this page and become a Member today! Get Heritage scholars and policy experts on major news outlets to relentlessly drive home this clear message: Unrestrained liberalism got America into this mess, and only conservative ideas can get us out. We plan to increase our penetration of both the mainstream and new media going forward. 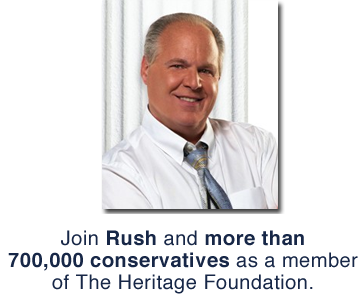 Recruit even more right-thinking Americans like you to become Members of The Heritage Foundation. Membership now stands at more than 700,000—a 255 percent increase over the past four years. And we are well on our way to our goal of one million Members—with greater influence for conservative principles than ever before. Keep the important issues like cutting spending, reducing America’s debt, and national defense at the forefront of every debate and discussion this coming year. Equip grassroots America with the information needed to keep lawmakers accountable to conservative reforms. Brief candidates on conservative solutions to America’s problems, and keep them informed with accessible research. Counter liberal spin in the media, upcoming debates, and conventions with sound analysis and fact-based research. Please act now. Time is short to seize this once-in-a-generation opportunity. The clock is also ticking on this historic opportunity to advance conservative reforms. As many as possible must be enacted and defended now, while liberals are on the run and we have momentum and public opinion with us. This is a crucial time for the future of the conservative movement—and America. Join Heritage today.